Home Welcome The fall of Palmyra – ISIS on the run? The fall of Palmyra – ISIS on the run? Posted about 3 years ago | Comments Off on The fall of Palmyra – ISIS on the run? 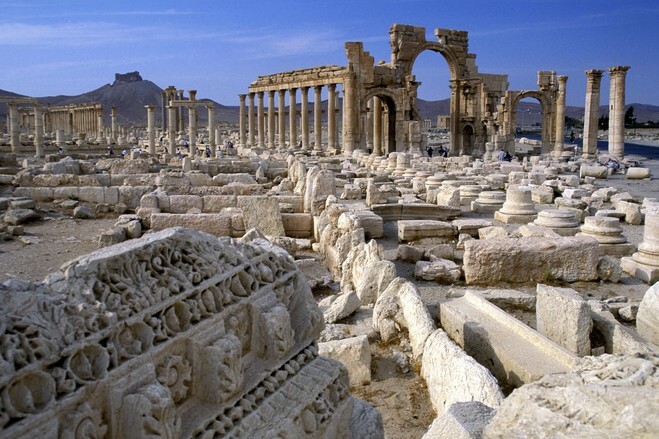 The historic archaeological-treasure city of Palmyra fell to the Syrian Army on March 27 (Easter Sunday in the West). Palmyra had been under the control of the Islamic State in Iraq and Syria (ISIS) since the terrorist group seized the city in May of 2015 – the seizure of Palmyra was part of a larger military campaign in which ISIS made huge territorial gains as it advanced on the major Syrian cities of Hamah and Homs. The retaking of Palmyra is the latest in a series of successful Syrian Army operations in the provinces of Homs, Hamah, Idlib and Aleppo. These are the very same areas that last summer the Syrian Army was forced to cede to anti-regime rebels – and in some instances, to jabhat al-nusrah (The Victory Front), the al-Qa’idah affiliate in Syria. The Syrian regime’s change of fortune is directly attributable to intervention of Russian Air Force fighters and fighter bombers operating from Humaymim Air Base in northwestern Syria, long range bombers operating from bases in Russia, as well as cruise missiles launched from Russian Navy ships in the Caspian Sea. That intervention began in September 2015 with the deployment of Russian combat aircraft to Syria, and has continued virtually unabated ever since. When Russian President Vladimir Putin ordered the deployment of combat aircraft to Syria, he claimed that his pilots were tasked with attacking terrorism targets – specifically ISIS targets. In reality, 85 to 90 percent of the strikes flown by the Russians targeted anti-regime rebels – the obvious goal of these strikes was to ensure the survival of the failing regime of Syrian President Bashar al-Asad. The rebels bearing the brunt of the Russian air strikes included groups receiving support – money, weapons and training – from the U.S. Central Intelligence Agency. In the recent operation to retake the city of Palmyra, the combined airpower of the Russian and Syrian air forces was the key factor in the success of the Syrian Army. ISIS has no air force and minimal air defense capabilities to use against Russian and Syrian fighters and helicopters. The two air forces were able to easily isolate the ISIS fighters in Palmyra from their logistics support about 120 miles to the north in ISIS’s self-proclaimed capital city of al-Raqqah. In the battle for Palmyra, the Syrian Army acquitted itself fairly well, given its mediocre performance over the last year. The Army did suffer what many Western countries would consider an unacceptable level of casualties. ISIS can be a formidable enemy, especially when attacking lightly defended towns in rural Syria and Iraq, but when confronted with a real army supported by effective air power, it is at a severe disadvantage. There are reports of Russian tactical air controllers on the ground with the Syrians. On one hand, ISIS’s loss of Palmyra to the Syrian Army is symbolic. It is another defeat – likely the most serious ISIS defeat thus far. They have been defeated now in Kobani and Palmyra in Syria, as well as Tikrit, Bayji and al-Ramadi in Iraq. ISIS leaders have to be concerned how this series of defeats might affect recruiting. Considering the high numbers of casualties the group suffers in its military operations, continued recruitment of new fighters is critical to its survival. On the other hand, the defeat in Palmyra is operationally significant – the city is a major logistics hub and the gateway to al-Raqqah. Recapture of the city will allow Syrian military forces to push east towards the ISIS-encircled city of Dayr al-Zawr, about 120 miles away. There is a besieged Syrian Army garrison there at an air base. The garrison has survived only by continuous airdrops of food and ammunition. The fall of Palmyra is not the end of the war against ISIS in Syria, although it may be a critical first step. Given the attempts by the U.S.-led coalition in Iraq to isolate the city of Mosul from the capital of al-Raqqah – by air strikes and ground operations by Kurdish peshmerga forces – ISIS may find itself divided into enclaves with no lines of communications between them. It maybe not be the end of the war, but it might be the beginning of ISIS’s eventual defeat. Then we can focus on saving Syria.